Well, it’s technically Autumn right now but it didn’t feel like it until today. Before today, we were having wonderful beach weather and we have been enjoying every minute we can of it. So for the past couple of weeks, we have been living on barbecues (or the way it’s said here barbies). I’m always up for a good BBQ but what I have come to realize that BBQ’s aren’t the same as what I’m used to back home. I don’t think it’s a USA vs. Australia thing but more of differences in family traditions. A typical barbie here consists of a lot of MEAT – steaks, sausages, and lambchops (rarely burgers) and salad on the side. 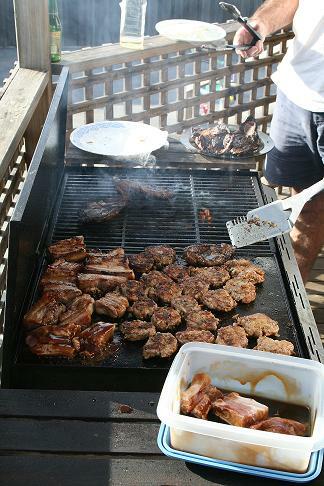 While back home, whenever we had a BBQ (which were usually social events – not just, “it’s hot so let’s eat outside” events), we would have mainly burgers and hotdogs, sometimes steaks & kebabs, and lots of other side dishes. So when I went to my first Australian barbie, I thought “ooh burgers” only to find there were no burgers, only a lot of other meat – which isn’t bad but I was disappointed to not see some delicious all beef patties that I could throw on a bun and cover with cheese, lettuce, tomato, onion, pickles, mayo, and ketchup! Share the post "Enjoying the last days of Summer…"